Vesta is a large asteroid that would just fit between San Francisco and Los Angeles. It's a small world, but a surprisingly grown-up one in ways that geologists appreciate. 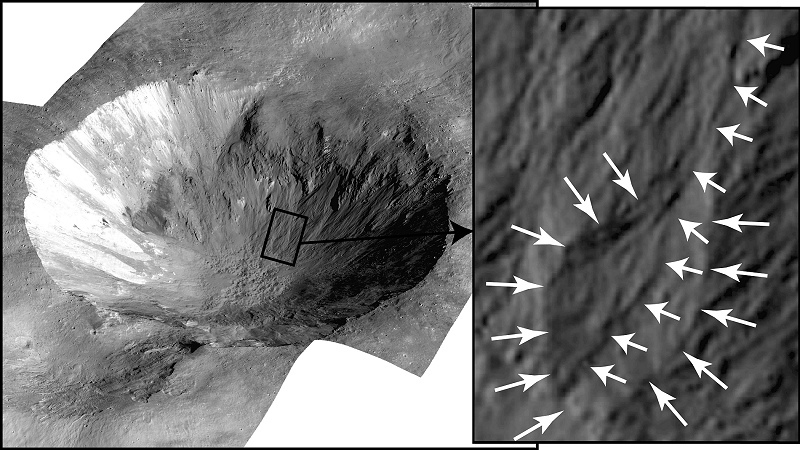 Now photos made during the year-long visit of the Dawn spacecraft show strong evidence that Vesta contains water inside it. Asteroids, common knowledge goes, are dry things made of rock and iron while comets are objects mostly made of ice and dust, and the two are completely unalike. But as our spacecraft have begun visiting comets and asteroids up close, the distinction between these objects has started to blur. In the case of the asteroids, we've been finding more and more evidence of water. The idea of the dry asteroid is part of our old thinking. When astronomers discovered their first asteroids, starting in 1801, they thought of them as broken pieces of a former planet that once orbited between Mars and Jupiter. Any object left over from such a violent history would surely have lost everything delicate to the vacuum of space—water, gases, organic compounds, all the kinds of things we find in frozen comets. In recent decades, with growing knowledge of the asteroids, Vesta has become more and more special. Unlike the thousands of other asteroids on the books, Vesta is an ancient protoplanet. When the solar system was forming from a cloud of dust, around 4.5 billion years ago, there were many protoplanets—objects that grew big enough and hot enough to melt inside and develop an internal structure just like a real planet, with an iron core, a dense rocky mantle around it and a thin crust of lighter rock. The largest of these protoplanets gobbled up the others in collisions, and they grew into Earth and its sister planets Mercury, Venus and Mars. A few survived, but Vesta is the only protoplanet that wasn't broken up during the 4 billion years since then (although it has taken a beating). The close visit by the Dawn spacecraft from 2011 to 2012 gave us a good look at the little world's geology. 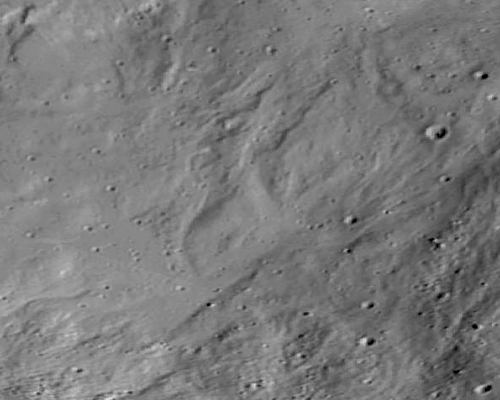 When researcher Jennifer Scully, at UCLA, started looking at the Dawn photos, she found suggestive features in some of Vesta's hundreds of impact craters. Her paper about them, with nine coauthors from five other institutions, appeared this week in the journal Earth and Planetary Science Letters. 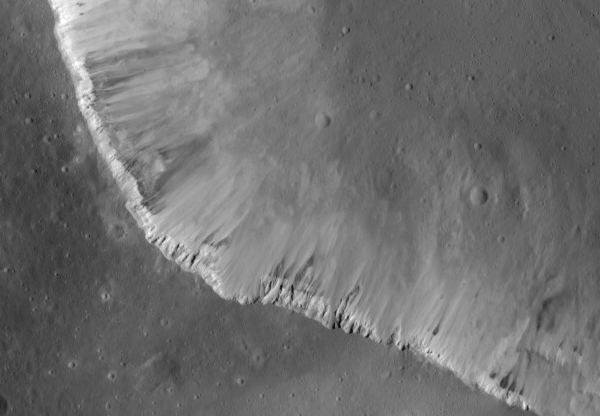 Most impact craters, on Vesta and elsewhere, have lots of pulverized stuff sliding straight down their steep walls. These look like the behavior of a bone-dry dirt pile. More interesting is places where the downward movement of stuff is organized in flows and curving gullies. On wet planets like Earth and Mars, gullies usually are a sign that water—or at least a fluid of some kind—once ran for long enough to create a channel. 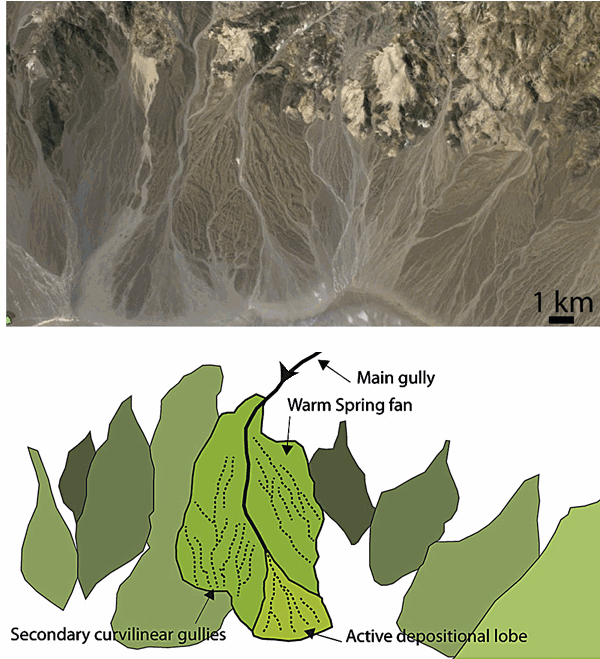 Scully's paper shows a good example from Death Valley. There, water and dirt combine to build up lobe-shaped deposits of sediment cut by networks of curving gullies. On Vesta, certain areas stand out in that they appear to resemble the familiar debris flows of Earth and Mars. But when we're talking about a strange world, "appear" and "resemble" aren't enough for a scientist. Scully's team made a complete census of Vesta and went all analytical on it, tantalized by places like this spot near the crater Cornelia. 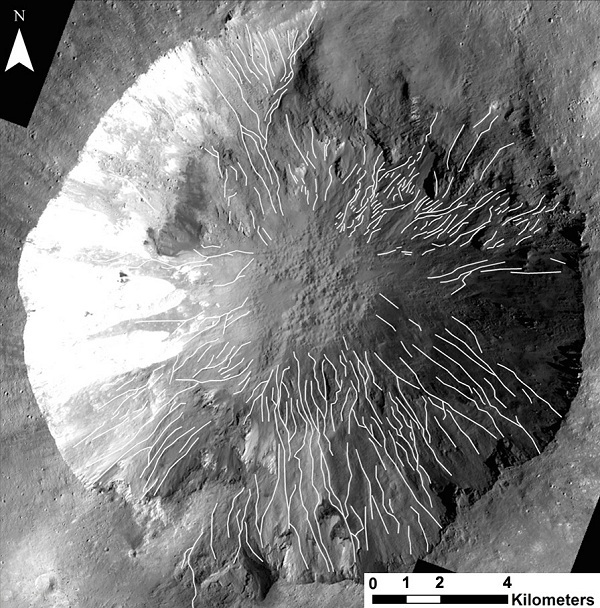 Among 170 likely places on Vesta, Scully's team found gullies at 59 sites. Eight of them had the most interesting type, curvilinear gullies. Inside Cornelia, Scully's team mapped this intricate network of gullies, like landslides and debris flows on Earth. Flowing water was the only explanation for them. Vesta is such a cold place, averaging about minus 130°C, that water can't exist there. Nevertheless we have evidence of it. Meteorites blasted off Vesta by impacts (known as the howardite-eucrite-diogenite group) contain minerals that require liquid water to form—even quartz, which is almost unheard-of anywhere but Earth. Scully's team concluded that parts of Vesta must contain buried deposits of icy material, which melted briefly whenever an impact struck the right place. They calculated that the gullies could have formed in Earth-style debris flows, containing up to 30 percent water, within a few minutes during the first half-hour after such an impact. Vacuum experiments showed that liquid water could have lasted for at least that long before freezing and then evaporating away. The strange, bubbly-looking terrain at the bottom of Cornelia is another sign of this scenario. Scully's team interpreted this "pitted terrain," by analogy with Mars and Earth, as a field of "degassing pipes." On Vesta, it arose as a sort of baked Alaska when hot stuff swept down in a blanket on top of icy stuff. Unlike a well-behaved baked Alaska, the ice responded in a series of steam explosions. In sum, even though Vesta appears bone-dry today, emitting no water vapor into the interplanetary space around it, it appears to hold areas of deeply buried permafrost. It's not the kind of asteroid we thought asteroids were. Where does that ice come from—was it delivered by hundreds of water-bearing impactors in Vesta's early days, is it a remnant of Vesta's original crust? The answer is important for understanding the solar system's infancy, but there's no way to tell yet. Although the Dawn spacecraft may give us more clues this spring as it arrives at the large asteroid Ceres. Ceres differs from Vesta in that it seems never to have differentiated into core and mantle and crust. It's not a mini-Earth. It emits water vapor into space. It may be more comet-like. Ceres, I'll bet, has lots of gullies too.